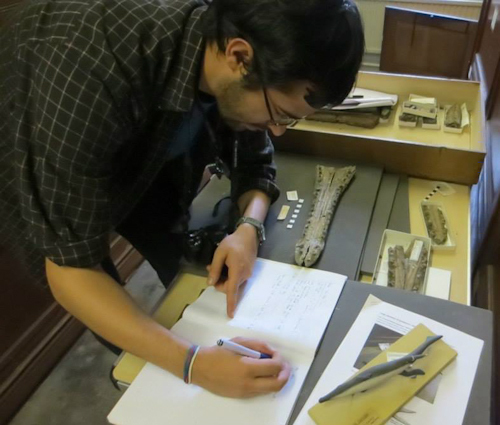 Today’s Interview with an Author is with Davide Foffa, first author on “The cranial osteology of Tyrannoneustes lythrodectikos (Crocodylomorpha: Metriorhynchidae) from the Middle Jurassic of Europe”, an article that we published last week. 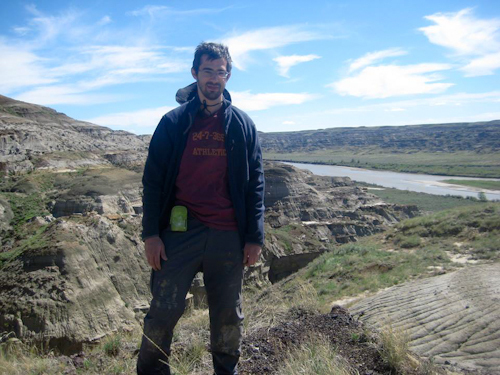 We were very interested in hearing more about his research on paleontology and his experience with us. PJ: Can you tell us a bit about yourself? AF: I am from a small town (Salo’) on the shore of Lake Garda, in northern Italy. I studied Geological Science in Pisa (Italy) and then I moved to Bristol (UK) for a Master of Science in Palaeobiology. After my MSc I stayed in Bristol for 2 more years continuing my research before moving to Scotland to start my PhD at University of Edinburgh at the beginning of September. Since my Msc project, I have worked on Mesozoic Marine Reptiles, focusing on their anatomy, taxonomy, biomechanics, form and function; this is an area of interest which I will keep on exploring during my PhD. PJ: Can you briefly explain the research you published in PeerJ? AF: Tyrannoneustes lythrodectikos is a marine crocodile (metriorhynchid) from the Middle Jurassic (about 165 mya ago). A mandible and few post-cranial elements from a young adult specimen was described in 2013 by Dr. Mark Young (who is the other author on the paper and one of my supervisors in Edinburgh) and colleagues, but until now there was no skull associated which could be referred to this species. Our research fills in this gap. We described 3 more specimens which include the first 2 skulls referable to Tyrannoneustes. This is important because the new information allows us to better understand the feeding ecology of this animal. For example we were able to confirm and expand the concept that Tyrannoneustes lythrodectikos may feed on much larger prey items than their contemporaneous relatives–which were more typical fish-feeding animals. Moreover one of the new specimen that we describe belong to an individual which we estimated was ~5 meter in total length, and yet was not fully grown. This makes Tyrannoneustes one of the largest metriorhynchid and, up to date, the largest in the Middle Jurassic European seas. PJ: Do you have any anecdotes about this research? AF: I was invited to take part to this project by Dr. Mark Young. Originally we had a single specimen to describe. However after the first round of review, Mark realized that there were some misidentified/unstudied specimens which could belong to the same species. And he was right! This required me to spend some more time visiting different museum’s collections. It was a great opportunity to assess all these new materials. The new specimens added further material and a lot of effort to re-structure the paper, but I can confidently say that all the extra-work contributed to produce a better piece of research. PJ: What surprised you the most with these results? AF: What is most surprising for me is the size of Tyrannoneustes. We realized immediately that the new specimen was definitely larger than the one described in Young et al. (2013). I have previously said that this was probably the largest metriorhynchid swimming in the Middle Jurassic seas and yet it was probably not the apex predator in its ecosystem. In fact, there were other marine reptiles called pliosaurids, and some of them (e.g. Liopleurodon) were considerably larger then Tyrannoneustes. PJ: What kinds of lessons do you hope the public takes away from the research? AF: I hope that this may be a way for the general public to become interested in palaeontology and particularly in this group of animals. Everyone knows and loves dinosaurs but that is not the end of the story! Under the sea, during the very same time when dinosaurs were dwelling on land, there was a fascinating number of marine reptiles. Of course I hope that people will appreciate the importance of the discovery but also the way it was pursued: by looking at museum collections. There is still an enormous quantity of material that needs careful and modern revision. PJ: Where do you hope to go from here? AF: Well, now I will focus on my PhD. My task for the few next years will be to study and compare closely the anatomy of the different groups of marine reptiles from the UK. 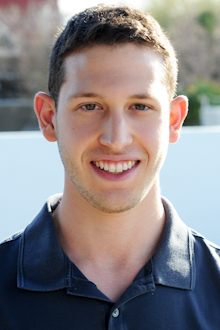 PJ: If you had unlimited resources (money, lab equipment, trained personnel, participants, etc. ), what study would you run? AF: Mmmh… This is a tough one. I would probably try to organize a project (on Mesozoic Marine Reptiles possibly!) which would involve itself with every step of a typical palaeontological discovery. This would include field expeditions, laboratories for fossil preparation and the final array of analysis and studies we can conduct nowadays. If I had unlimited resources I would make available a laboratory filled with the state of art equipment and facilities (CT scanner, 3D printers; microscopes; computers/softwares; training sessions, etc..). Ideally such a project would allow all the personnel to be able to engage (and get trained) with both traditional palaeontology skills but also to be update with the latest developments in the field. This means in particular, an environment which allows the users to discuss, adopt and even develop cutting-edge techniques and methods. AF: I am personally a big OA supporter. I was well aware of the journal (through Twitter, mainly) way before deciding to submit to it. Then Mark and I were invited by two colleagues to submit here, so we took the opportunity! PJ: Do you have any anecdotes about your overall experience with us? Anything surprising? AF: I was very impressed by the rapidity of the review and positively surprised by the flexibility of the review process. The editor understood that the new specimens we found would have required more time for us to submit our revised manuscript, and they were happy to extend the resubmission deadline. This allowed us to take our time to carefully study the collections and produce a better piece of work than we could have if we were under the pressure of a strictly enforced deadline. PJ: How would you describe your experience of our submission/review process? AF: The submission was incredibly straightforward and user friendly. It is certainly something that positively distinguishes PeerJ from other journals. As said, we experienced a very positive review process: it was very quick, professional and comprehensive! AF: Yes we did! Many of them congratulated us and we had some positive feedback from colleagues, which is always nice to hear! PJ: Would you submit again, and would you recommend that your colleagues submit? AF: I would absolutely encourage my colleagues to submit to PeerJ. I already did, in fact! AF: I would like to thank again all the people who helped in various ways in this project. In particular Lorna Steel (NHMUK), Phil Hurst (photography department of NHMUK), Glenys Wass (PETMG), Matt Riley (CAMSM) and of course the PeerJ Academic Editors and reviewers! I take this chance to thank again Dr. Mark Young, first of all for entrusting me with this project, then for the guidance and invaluable help and effort he put in this work. AF: Thank you for the opportunity! Join thousands of satisfied authors, and experience the future of publishing. Submit your next article to PeerJ or PeerJ PrePrints.